Knob-handled Patera, ca. 320 B.C., Greek, attributed to the White Saccos-Chariot Group, terracotta. Virginia Museum of Fine Arts; Adolph D. and Wilkins C. Williams Fund. RICHMOND, VA.- From myth and legend to warfare, transportation, and sport, the horse was integral to ancient Greek life. This winter, the Virginia Museum of Fine Arts presents The Horse in Ancient Greek Art, a ground-breaking exhibition that explores the Greeks fascination with an animal that served as a symbol of wealth, power, and status in ways that are recognizable and familiar even today. The Horse in Ancient Greek Art features 78 Greek vases, sculptures, and coins from the 8th through the 4th centuries BC. The objectssome on public view for the first timeare drawn from private collections and museums such as VMFA, the Metropolitan Museum of Art, and the Tampa Museum of Art. The Horse in Ancient Greek Art, curated by Dr. Peter J. Schertz, VMFA Jack and Mary Frable Curator of Ancient Art, and Nicole Stribling, Curator of Permanent Collections National Sporting Library & Museum (NSLM), is a free exhibition organized by VMFA in partnership with the NSLM in Middleburg, Virginia, which hosted the exhibition from September 9, 2017, through January 14, 2018. The exhibition begins with early images of horses on objects from the Geometric Period (ca. 900700 BC), named for the geometric patterns and intricate designs found on artwork of the era. From there, objects dating to the Archaic through the Classical Periods (ca. 700323 BC) are organized by key subjects. Myth and legend are illustrated with fantastical horses and horse-hybrids, such as Pegasos, the famous winged horse, as well as satyrs and centaurs, two creatures that combined human and equine elements. The horse in war is depicted in scenes of ancient cavalry and chariots, as well as hunting, which was considered good training for both war and competitive events. The practice of horse care is explored through images of grooms tending their charges and examples of ancient tack. Finally, vases and coins showing equestrian sports, including chariot racing, reveal the significance of competition in the ancient Greek world and highlight the skills and accomplishments of ancient equestrians. 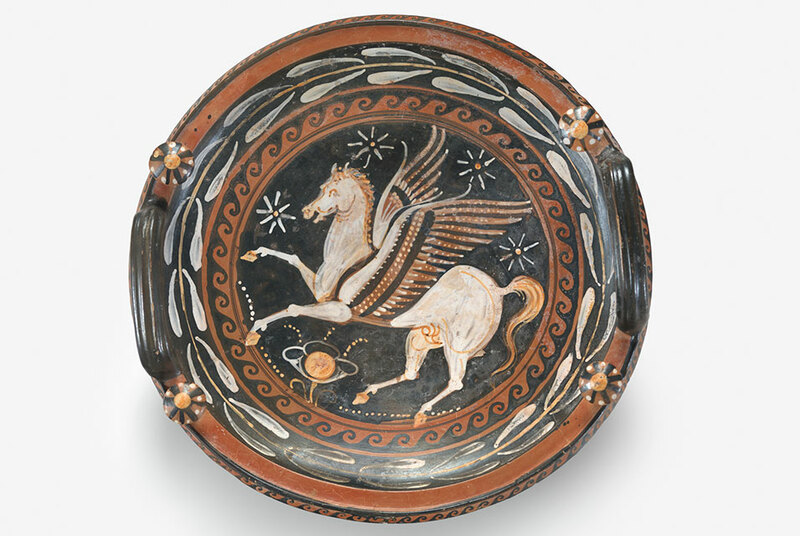 The horse in ancient Greek art has rarely been addressed in museum exhibitions, and the institutional strengths of our two museumssporting art at NSLM and ancient art at VMFAperfectly complemented each other for this project, said Dr. Schertz. Loans from private collectors and other institutions, combined with objects from VMFA, provided a unique opportunity to explore this topic in a way that also expanded our understanding of these works of art. The Museum of Russian Icons opens "Rushnyky: Sacred Ukrainian Textiles"